To convert a midi file, you have to add it to the file list and click on "Conversion". The software needs now to have a directory where your files should be saved and the conversion starts. The file name of each file is generated automatically starting from the name of the original midi file. The record volume that you select is supposed to be the loudest volume that can have a sound in the file, but this is only true if you select "Normalize" (see above). If you don't select "Normalize", the software doesn't calibrate the sound and in this case the software assumes that the maximum volume in the midi file is 100% (this is usually wrong but it's not a big deal). If you select "Normalize" don't use a sound volume that is higher than 100%, because it can produce noisy sounds locally (effect of saturation). If you don't calibrate the software, you'll save some seconds for each conversion. 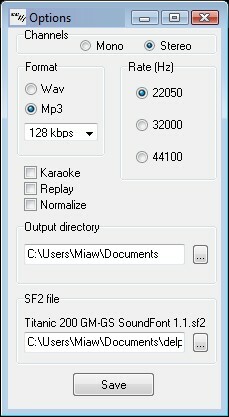 The "Karaoke" option allows to read Karaoke files with their related lyrics. This option is useless during a conversion. Notice that with this software, you don't need to convert the files to listen what you should get after a conversion. In fact you could just play your midi files with the software directly. You will notice, if you read a midi file inside the software that the sound that you get is not exactly the same as the sound that you could get with your sound card. This behavior is related to the fact that midi files have to be interpreted and in the software it is done with a SF2 file and not with the synthesizer track of your sound card. A SF2 file is basically a bank of sound samples. If you have a soundblaster card, your own card uses a SF2 bank and it's perhap's possible to use your own sound bank in the software. In any cases, the sound that you will get is directly linked with the quality of the SF2 file that you use. The quality of the sound bank packed in the installer of the software is pretty good, but it is possible to find better, you could for example get the "Titanic 200 GM-GS" bank for free and its quality is interesting, but i don't pack it in the installer because of its size (226Mo). MeowMidi2Mp3 is a shareware limited to 30 days, this means that after a trial period of 30 days, you have to buy a licence if you want to use the software further. - Or, copy and paste this file in the same directory as MeowMidi2Mp3. - Or, open this file and use the first line as name and the second as serial number. 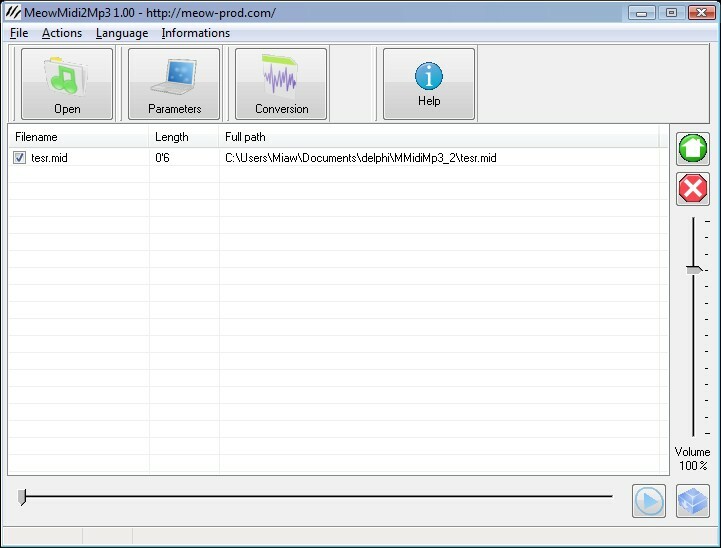 Midimeow is basically a recorder that uses your sound card: you will get on your resulting files what you listen with your sound card. A lot of people seem to have problems to adjust the parameters of their sound card, if you are in this case you should use MeowMidi2Mp3. MidiMeow is better if you know to change the parameters of your sound card using its driver and if you have a very good soundcard. MeowMidi2Mp3 is faster than MidiMeow, but some people could be annoyed with the fact that you don't get the same result as with your sound card. If you don't know what software to buy, use MeowMidi2Mp3 since it is easier and faster to use.